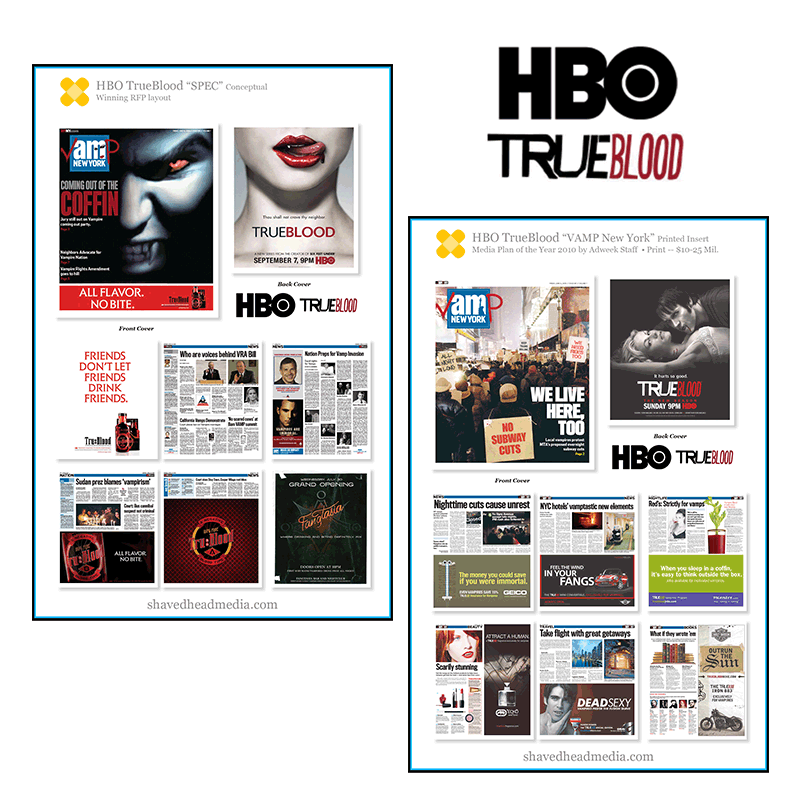 EXPERIENCE — Shaved Head Media, Inc.
We won the bid for HBO TrueBLood Season 2 launch with a fictional 8-page newspaper insert we called VAMP New York. Each page had a unique, personalized Vamp spin. It was a special project. “To bleary strap-hangers, the story in the June 12, 2009 issue of am New York on protests over subway service cuts might have passed for a typical day in the Big Apple. But to read the story, and the ads that accompanied it, one might be led to believe that the city that never sleeps was being stalked by vampires.” Lucia Moses of AdWeek. Created a three–month Google Adwords campaign, and a supplemental social media ad campaign with great results. Boosting their dumpster rentals to double digit percentage points, year over year. Filco Carting Corp. established in 1910, provides dumpster rentals, non-hazardous waste removal, disposal & recycling services for nearly 5,000 commercial, industrial & institutional firms in the New York City metro area. Design and marketing the 1920s Prohibition themed Beer and Whiskey tasting festival, exclusively. Featuring four floors and over 40,000 square feet of beers and whiskeys from around the world. 4 years consecutive sell out crowds! That’s over 1,500 each event! We created a Broadcast TV Commercial from a flyer. The production was televised during the live 2013 Veterans day Parade on Fox 5 New York. As a start-up, Dawgs All Day needed “the works”– new logo design, marketing materials, social media presence, and a website. We started with zero. We’ve been marketing partners over 3 years. We created, prepared and delivered a Native American themed, buffet style food service for Eagle Project’s fundraising event at the AFA Gallery in SoHo, NYC. Created an authentic Indian Fry Bread recipe. Catered for more than 150 guests.